Welcome to the July edition of the Simply Living Blog Carnival - With Kids cohosted by Mandy at Living Peacefully with Children, Laura at Authentic Parenting, Jennifer at True Confessions of a Real Mommy, and Joella at Fine and Fair. This month, we write about keeping things simple with our kids. Please check out the links to posts by our other participants at the end of this post. These are our experiences and tips on how our family lives more simply. Some of our experiences are a little fringe, so I don't expect everyone to be able to apply them — but maybe it will give you some food for thought! Sam and I both are self-employed, so we trade off taking care of our kids and working. I don't think that's all too common, but it's working well for us — we both get lots of family time but also time to earn money and pursue our passions. We eat the same things over and over — and like it! Hey, if you know what you like, you know what you like. I've never gotten frustrated by eating something yummy repeatedly. Sometimes I think, Oh, no, that must mean I'm so boring. But when I can reframe it by saying, "We're living in simplicity," suddenly it's something that came out of a gauzy magazine with soft-focus photographs of flowers and a delicious, oft-repeated meal on white plates in the foreground. And then it's in style! What we tend to do is pick meals and snacks we like, then eat them to death for weeks and months. Once we've gotten bored of one or two, we've usually glommed onto another favorite that we then eat and eat until we can rotate back to an earlier one. Easy-peasy! We don't have to menu plan, and we always have the ingredients we need or know what to buy when we're at the store. We don't do much of it. We're all, so far (Alrik's an unknown), introverts. We need a lot of time to decompress after being social. So we just … don't see other friends all that much. I don't want any snarky questions about how, then, my homeschoolers socialize. We do, and they're not feral, thankyouverymuch, but we limit it to what works for our peace of mind: about one or two playdates or other social outings per week. In addition to not being too social, we're not too structured. We go out a lot, but we like to wing it, see what we're into that day (rolling over to the playground? an ambitious downtown outing?). Fortunately for our simplicity, Mikko hates taking classes. He does all right if a parent can be a participant, but there are very few such classes, so we really don't take many. That frees up our schedule to be all loosey-goosey and such. Sometimes I feel bad being out of the parental rat race to get my kids up to speed on swimming and gymnastics and martial arts and violin and all that … but … meh. He's fine. We're fine. And our lives are a lot less hectic than they'd be otherwise. Not having school also simplifies our lives. I couldn't believe how much a twice-a-week, half-day preschool bit into our time, and spilled over into what we could manage other days. (For instance, it changed and prematurely ended Mikko's nap routine.) When we quit preschool, our days were so much freer — despite the fact that we were now missing out on about 7 hours of childcare per week. But that 7 hours had included along with it the driving time there and back, the disruption in the day, the decompression Mikko needed afterward…. I'm glad we're unschooling, because I can imagine our days being so compartmentalized and our free time and family time so rare if either kid were in school for several hours each weekday. If we get rid of anything, it's behind his back. And it's possible, because we have too much clutter for him to realize something's missing, but I dislike being sneaky. I'd really, really rather he want to give some of his things away to make room: room for new things, sure, but also room to play with the things he has, room to put things away tidily, room to find things easily, room for peace about the cleanliness of his environment. But I'm feeling kind of hopeless about this, because: He's got genetic drawbacks on both sides. His mother (ahem) is a reforming packrat. Sam's side of the family goes beyond packrat into full-on hoarding. I know this; I fear this; I want to prevent this for my children. But how? I wish we were more organized so we could make a one-in-one-out sort of rule stick — or "You get X much space / X many bins for toys, and whatever you want has to fit in there." But we're not that organized…and I worry we'll never be. 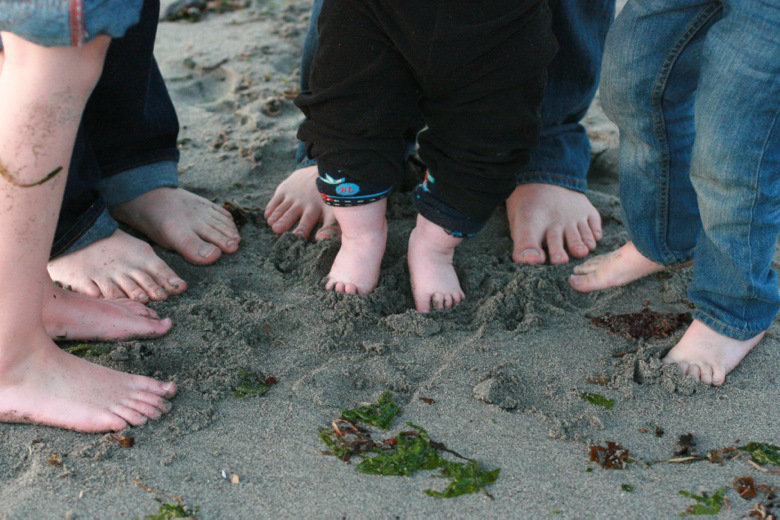 How do you simplify your family life, or how do you wish you could? Thank you for visiting the Simply Living Blog Carnival cohosted by Mandy at Living Peacefully with Children, Laura at Authentic Parenting, Jennifer at True Confessions of a Real Mommy, and Joella at Fine and Fair. 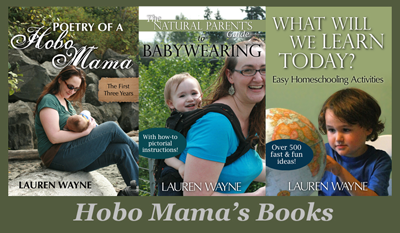 Read about how others are incorporating simple living and parenthood. We hope you will join us next month when we discuss celebrations! Two Tactics for Simplifying with Twins - Organization doesn't come easily to Mercedes at Project Procrastinot, but here she shares what works for her. Balancing - Keeping a work life balance with children is really hard, in her post Balancing, sustainablemum explains how she found her balance after her children were born and how this is about to change again. Simplifying With a Baby - Kellie at Our Mindful Life is amused at the differences in what her first baby needed and what her fourth baby needs. How we simplify our family life - Lauren at Hobo Mama describes the unconventional ways her family keeps things loose and low-key. Flexible Structure - Joella at Fine and Fair shares how her family works to allow for flexibility in their routine to help keep things simple. Helping Kids Simplify- At Living Peacefully with Children, Mandy discusses how she helps her kids keep things simple. Keeping it Simple with a Highly Sensitive Child - At Authentic Parenting, Laura shares her family keeps things simple while dealing with sensitivities. Simplifying looks differently for every family, and we all have to figure out what works for us. As far as helping our kids not become pack rats, I think the best thing we can do is talk to them, and verbalize our reasons for ourselves. Then we can help them go through their own things by being there. And as a family of 6 introverts (probably soon to be 7), I understand on needing time to decompress. We love our friends, but we need time to chill out without people. We simplify in much the same way that you do, a few play dates a week and no classes for the same reasons. When it comes to toys I do the go behind their back way and I have to say I have found that they have never asked for the toy again, probably because they have moved on to other things. I usually remove the toys and put them somewhere hidden and wait a month or so to see if they ask if I have seen it before passing it on, but like I said they never had. I usually do the toy removal around their birthdays and Christmas as this is when we get a large influx and we need space for the new ones. We too live in a small space so we would be overwhelmed if I didn't remove some toys. We are a family of extroverts (except for Daddy), and we still only do about that much out of the house activity every week. It isn't just the people, it is the need for time to do things besides drive and take care of structured things. My kids need time to run, climb, build train tracks, and use their imaginations. It is hard to do those things at the grocery store! I am a very picky extrovert! Or maybe I'm just a snob? Well either way, I am a homebody and we don't socialize that much either. And it works fine for us! As a reformed/ing packrat myself, I can relate to the woes of passing down organizational habits. Thankfully my husband is my opposite in that regard. I think it's the engineering thing. Phew!